Good morning my wonderful crafty friends. Did you know that My Treasured Kutz is doing weekly freebies? Every week starting on Thursdays they will be giving away an SVG file for FREE. How awesome is that? I would think just about everyone loves free stuff, I know I do. So don’t miss out, hop over to mytreasuredkutz.com every Thursday and check out their new freebie. Don’t fret if you ever miss out on a freebie; if it’s something you really like, you’ll still be able to purchase it in the store. Okey, enough about that… Now onto my card. If you couldn’t guess I created this beautiful card using My Treasured Kutz weekly freebie. 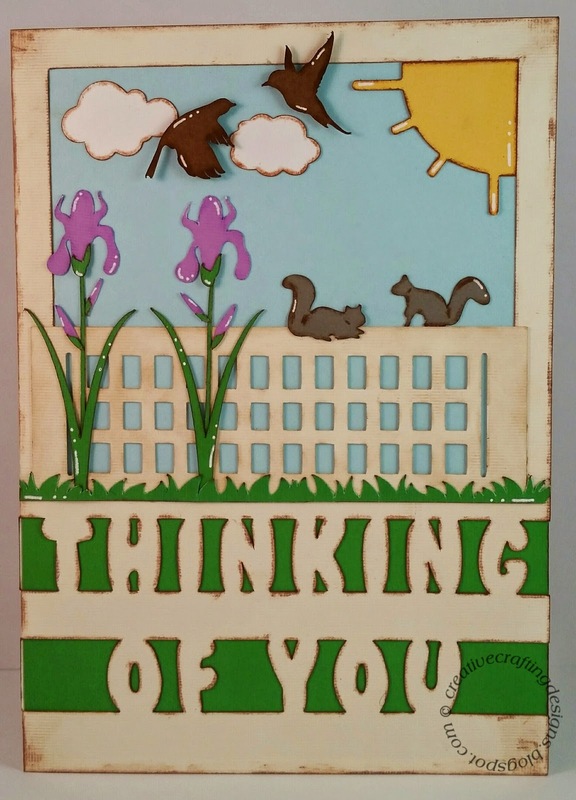 This weeks freebie is called Thinking Of You Background Card. It’s an SVG file that comes with the “Thinking Of You” card background, the fence, the sun and two background mats. The other images on the card were all created with My Treasured Kutz metal dies. I have got to say, My Treasured Kutz has become one of my favorite metal die companies and the SVG files that they’re coming out with just keep getting better and better. I can’t wait to see what more is to come in the future. The freebie was cut on my Cricut Explore using DCWV paper. I inked the edges of everything except for the fence and the purple part of the Bearded Iris which I chalked. The ink I used is Rubber Stampede Acid-Free Die-Based ink and I used a disposable lip applicator to apply it. For the chalk I’m not sure who makes it, it is something that I bought at a yard sale years ago. I applied the chalk using a disposable lip applicator and chalk pompoms. *When I chalk using the the disposable lip applicators I brush it along all the edges and inside all the small places, blowing off the extra dust as I go along. I then use the chalk pompoms to spread the chalk out on my die cuts. That’s how I get the chalked look like the fence has. I used my Xyron Sticker maker and my Elmer’s Tape Runner to adhere everything to my card. I finished up my “Thinking Of You” card by adding a touch of white by using A Sakura Gelly Roll pen.